The time has come. After four seasons, Star Wars Rebels has come to an end. We wondered about which members of the Ghost crew would make it to the end. Many, myself often included, looked at the characters and didn't think they could make it out of the series alive. It's Star Wars, not Star Live Happily Ever After. But I was unnecessarily cynical. The end of Rebels was a gift, a series of satisfying endings and an open door. Before Ezra disappeared, he told Sabine he knew he could always count on her. So, she remained on Lothal and protected Ezra's home in case the Empire returned. They never did. 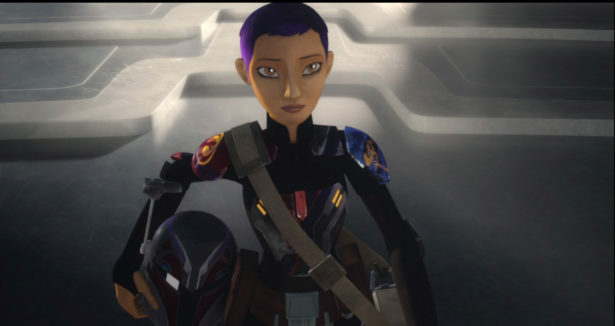 And through Sabine, we learned what happened to the crew of the Ghost. The final minutes of Star Wars Rebels jumped into the future to after Return of the Jedi and the Battle of Endor. Zeb and Kallus used to be enemies. But things changed in the season two episode “The Honorable Ones.” Stranded together on an icy moon, the rebel and the Imperial started to understand one another. Kallus soon defected from the Empire and joined the Rebel Alliance, and his friendship with Zeb strengthened—no small feat considering Kallus once participated in the partial genocide of Zeb's people. So, it's a huge moment for Zeb to take Kallus to Lira San, the Lasat homeworld. And I might be reading too much into this, but I think they could be together romantically now. What do you think? We knew from Forces of Destiny that Hera survived until at least the Battle of Endor, and Sabine's narration confirms she and Captain Rex fought in the important battle. The big surprise here is her and Kanan's child, Jacen Syndulla. At some point during season four of Star Wars Rebels, Kanan and Hera were uh, busy. Can you just imagine Chopper around a toddler? Sabine looked out for Lothal, presumably staying there despite anything that may have been happening on Mandalore. Ezra was her family, and eventually she realized he wasn't gone. The purrgil (please note the purrgil art on Sabine's shoulder armor) could have protected Ezra when they made the hyperspace jump with him and Grand Admiral Thrawn. And once Sabine discovers Ezra is still somewhere in the galaxy, Ahsoka Tano, dressed like a glorious Togrutan version of Gandalf the White, came to help look for him. Give me a Sabine and Ahsoka spinoff series right now, please and thank you. What do you think about the jump to the future? Did you cry over baby Syndulla and knowing Ahsoka Tano survives until at least after the Battle of Endor? Let us know in the comments. A Star Wars Rebels fan edit that unites the saga. Dave Filoni on the return of Ahsoka Tano. Rebels says goodbye to Kanan Jarrus.